Not that what you have is bad, but I think your index needs to be updated to provide a more complete picture of what's happening. Some of the styles and locations need to be changed out. 1. Places have to be somewhere I can easily get to on a bicycle. 2. Retail places have to carry all (or maybe all but one) of the bottles on the index. 3. Conversely, to get on the index, a bottle has to be available at all (or maybe all but one) of the retail places. 4. Beers on the index must be brewed in Oregon. 5. I would like to keep a certain amount of geographic and style diversity in the bottle list, as long as #3 and #4 are met. I recognize that there are a lot of new breweries and new favorite beers in the four years since I started this. That said, the main goal is to show the change of beer prices over time, so I try not to jostle the composition too much. I'll admit that I talk about the numbers as though they represent an accurate average or typical beer price, but that is simply hubris on my part. 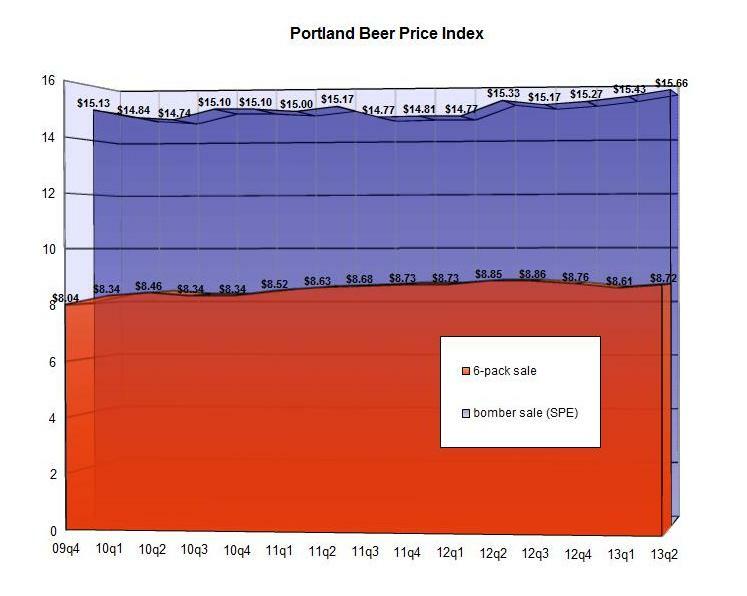 If you averaged the price paid for every bomber sold in Portland, I think it would be a much higher number; if you averaged the price paid for every six-pack it would be much lower. Just a comment on the bombers graph. Most of us small brewers cannot afford a bottling line, meaning we have to hire a mobile bottling line if we want our product on the shelves at all. This pretty much means 22 oz bombers and of course an increase in cost to us. Keep up the good work. Love reading your blog. Bill - in one of the comments on the Bomber Price Penalty post, you wrote "if the beer is available in both 22's and 6-packs, your cheapest, smallest option is to buy a single 12-ounce bottle from the 6-pack." I know John's Market allows this. Do any of the major grocery stores? After almost five years of the $5 Imperial we had to bump up the Brewers Union Imperial Pint (liquid to line) to $5.50. Sounds in keeping with the trends. Beer prices are going up October 1. Looks like 6 packs are going up $1.00 per case at cost.